Historic brand Dolomite launches its new Life Style collection for next spring/summer. Its inspiration is drawn from the brand’s own past, a blend of craftsmanship, conquests and strong emotions that continue to distinguish this firm from Treviso, Italy. Vintage design is combined with a careful eye to comfort, creating shoes with a sleek, minimal line in which attention to detail and the selection of top-class materials are the expression of a cosmopolitan spirit, suitable for numerous different uses and occasions. A collection to suit a wide range of personalities: from those who adore the brand’s vintage lines, to more sporty sorts, to travellers with a young, informal style that favours comfort every time. 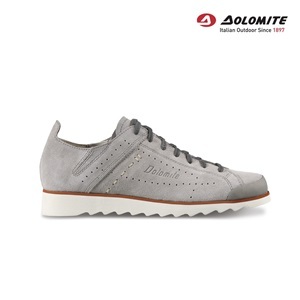 This is the starting point for the development of a new product concept, to offer women and men an easy-to-wear shoe that is light and comfortable, with an original design and natural colours. The watchword here is easy fit: simple to wear, comfortable for travelling, with a light, summery sole. CinquantaQuattro Travel in suede leather, with color stop treatment, lined in full-grain leather, and featuring artisanal stitching on the sides.